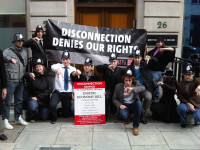 Several years ago, the United Kingdom passed the controversial Digital Economy Act, which included provisions for disconnecting Internet users accused of repeat copyright infringement. That bill generated protests, but ultimately passed. The disconnection provisions never took effect, however, as they were the target of legal challenges. Now reports indicate that the copyright enforcement scheme has been shelved altogether as rights holders and Internet service providers have reached agreement on a voluntary system that looks a lot like Canada’s notice-and-notice approach. The system involves a maximum of four warning letters to a customer per year. There is no disclosure of the subscriber information and no threat of loss of Internet service. Rights holders can take further legal action if they so choose. I wrote about Canada’s notice-and-notice system here (which similarly involves notices, no disclosure of personal information, and no loss of service), discussing its effectiveness and warning against the possibility that the Trans Pacific Partnership could be used to override the “made in Canada” approach.